Carte Generale de la Pologne avec tous les Etats qui en dependent. 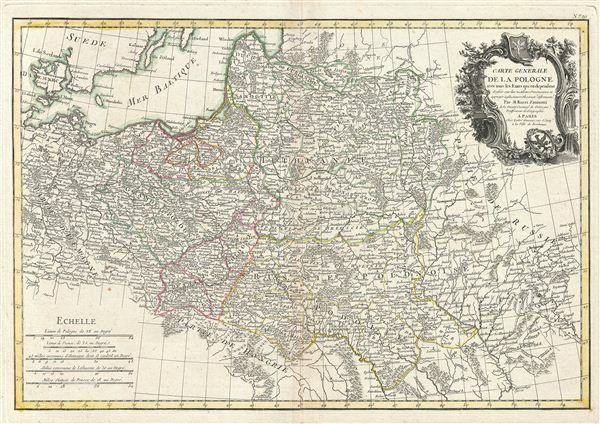 A beautiful example of Rizzi-Zannoni's c. 1783 decorative map of the Poland, Lithuania, and their tributaries. This map covers from Denmark and Germany eastward to Russia, northwards to Livonia and south to Hungary. Includes Lithuania, Prussia, Greater Poland, Lesser Poland, and parts of Russia, Germany, Hungary and Bohemia. A baroque style decorative title cartouche depicting the Polish eagle crest appears in the upper right quadrant. Despite the date, this map illustrates Poland in the waning days of the Polish-Lithuanian Commonwealth, just prior to the 1772 First Partition of the Commonwealth. In 1764 Stanislaw August Poniatowski was elevated by election to become King of Poland. This worldly and refined ruler attempted various reforms intended to preserve the failing Polish state, but found himself increasingly subservient to Tsarina Catherina II of Russia. The Bar Confederation of 1768, a rebellion against increasingly Russian influence over Polish politics, led to the First Partition of the Commonwealth, a permanent annexation of Polish territory by its more powerful neighbors. Subsequent partitions in 1793 and 1795, would eventually lead to the disintegration of the Polish state, though it was later reconstituted during the Napoleonic Wars. Drawn by Rizzi-Zannoni 1783 for issue as plate no. 10 in Jean Lattre's 1783 final issue of the Atlas Moderne. Rumsey 2612.038. Phillips (Atlases) 664. National Maritime Museum, 215. British Libarary (World), col. 384-385 (1762-1785 eds. ).